The first of the IUCr-UNESCO OpenLabs was held at the International Centre for Chemical and Biological Sciences (ICCBS), U. of Karachi, Pakistan, from April 30 to May 8, 2014, in conjunction with the IYCr2014 South Asia Summit Meeting on Vistas in Structural Chemistry. The OpenLab Pakistan was organized in partnership with Bruker. A keen interest was shown in the OpenLab from throughout the South Asian region and beyond, as was evident from the number of applications, which was close to 250. However, after careful consideration, 50 applicants were selected. The applicants were PhD students, early-career researchers and faculty members working in chemistry, physics and material sciences. Most of the participants were from Pakistan; however, there were also participants from Nepal, Sri Lanka, Saudi Arabia, Egypt, Bangladesh and as far afield as Cameroon. Most of the participants were provided with travel grants. The participants were also given luxurious accommodation in the ICCBS guest houses, meals and in-campus transportation. In addition, all participants were able to take part free of charge in the above-mentioned IUCr-UNESCO South Asia Summit Meeting, which was held April 28–30 at the same venue. This proved highly beneficial in creating awareness about the wider significance of the subject about which they were going to learn during the OpenLab. It also gave the participants a chance to interact with foreign delegates and renowned crystallographers. The OpenLab Pakistan was organized into morning and afternoon sessions on each day. The morning sessions comprised theory lectures and use of various crystallographic software, and the afternoon sessions were dedicated to hands-on training on a Bruker SMART CCD area-detector diffractometer. The lectures were conducted in a state-of-the-art classroom where each participant was provided with a computer with high-speed internet access. Individual hands-on training ranging from crystal mounting, alignment and data collection to safety measures in the lab was provided. The OpenLab topics were carefully selected and were aimed at enabling each participant to independently solve and interpret the structure and to prepare the CIF file for publication. The panel of resource persons was supported by Bruker's technical expert Mr Muhammad Hussain to assist in instrument handling and demonstration. Gautam Desiraju lectures to the OpenLab Pakistan participants. The day of inauguration of the OpenLab started with a very insightful and interactive lecture by Gautam R. Desiraju on 'Use of the Cambridge Structural Database in Analysis of Small-Molecule Crystal Structure'. A freely available teaching subset offered by the Cambridge Crystallographic Data Centre (CCDC) was used to teach preferred packing of molecules in the crystals. 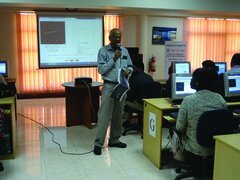 In addition, the participants were connected to the online version of Prof. Desiraju's textbook Crystal Engineering. Using both online resources, Prof. Desiraju explained the role of various interactions in crystal packing and how it is ultimately responsible for the bulk properties of the material. Srinivasan Natarajan delivered an illustrative lecture on the basic theory of X-ray diffraction from crystals, polymorphism and metal–organic framework (MOF) compounds. Sammer Yousuf was responsible for demonstrations and providing hands-on training on crystal selection, mounting and alignment to all the participants. She also provided hands-on training on the use of SHELXTL to solve the crystal structure using X-ray data. Muhammad Nawaz Tahir demonstrated various advanced aspects of crystal structure solution specially dealing with difficult structures, disorder and twinning. Maqsood Ahmed delivered theory lectures on data reduction, space-group symmetry, structure solution and refinement, spherical and multipolar model approximations and X-ray charge-density analysis. He provided hands-on training on the use of WinGX, Mercury, publCIF, MoPro and the CCDC's Cambridge Structural Database. There was a lecture on reading and understanding International Tables of Crystallography Volume A. A full session was dedicated to powder X-ray diffraction and peak indexing in a powder diffractogram. A short quiz was organized at the end to assess the level of understanding of the participants. The success rate was highly encouraging. Various prizes including cash prizes were given to those who performed well. The closing ceremony of the OpenLab Pakistan was held on May 8. Certificates were awarded to the participants by the Director ICCBS, Karachi, Muhammad Iqbal Choudhary. The participants were very enthusiastic about introducing crystallography into their university curricula and about promoting it in their respective countries. Reports from other IUCr-UNESCO OpenLabs, such as those taking place in Morocco, Ghana, Cambodia, Uruguay, Turkey and Algeria, will appear in future issues of the IUCr Newsletter.